At Retro Planet we strive to bring you unique new products that are engaging and fun. Among the latest are the assortment of coffee mugs with original designs by our artists and innovative graphics made from photos of found objects from our own vintage finds collection. Collectors (and people like myself that love to attend flea markets and antique stores) will love the unique look of these coffee mugs—and you can only find them at Retro Planet! 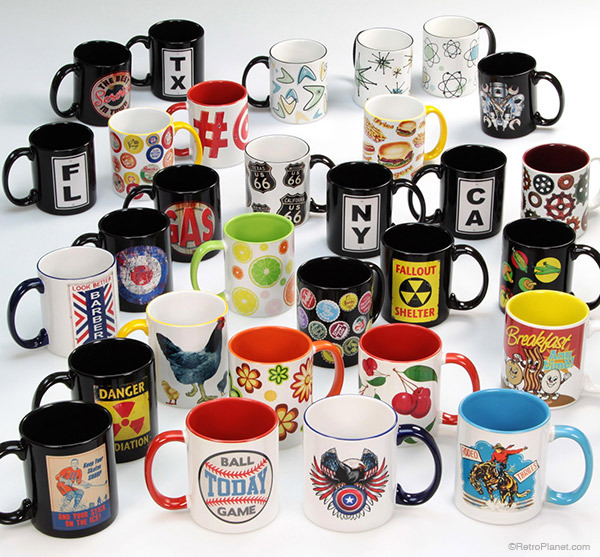 These are just some of the retro style coffee mugs we offer that feature original Retro Planet artwork. There are mugs for all types of hobbies, interests and styles of decor. These mugs are unique and make terrific gifts—there’s a little something for everyone! The fabulous retro style ’50s patterns include Boomerangs, Atomic and Atomic Starburst designs. These very popular designs are perfect for adding some retro modern style to your kitchen or workplace. Our vintage coffee mug designs range from cool highway signs to illustrations of fruits and vegetables that would be perfect to add to your rustic kitchen decor. A variety of state abbreviations that currently include CA, FL, NY and TX Mugs. There are more great designs not pictured here, so be sure to have a look. There are mugs for guys and gals in a variety of themes and color schemes. They work as a set or as a single quirky coffee mug given as a gift. Our goal is to continue to bring you exciting new designs, so check back often to see what retro mug designs we’ve added!